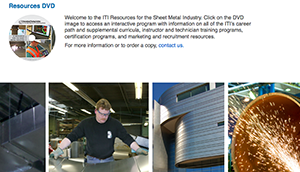 Training sheet metal workers to properly—and profitably—perform the tasks involved in industrial projects can’t be a “sidebar” to getting them ready to do commercial HVAC work, according to James Shoulders, administrator for the International Training Institute. “There are a lot of opportunities to make mistakes in industrial work, and these mistakes can wipe out the profit a contractor might have planned on a given project,” Mr. Shoulders said in a recent interview. “For example, there are various types of metals—stainless steels, Inconel, hastelloy—that come in varying thicknesses. These are expensive items. An error in doing the layout here will be very costly,” he said. ITI offers a broad and deep range of industrial training materials, including DVDs (which make extensive use of video) and books (also available via e-reader). Some of the industry’s 152 local training programs make good use of what is available, Mr. Shoulders said . . . others perhaps are led to adopt short-cuts. “It’s really up to the contractors—especially those active on the local JATCs—to push for proper industrial training,” Mr. Shoulders noted. “First, there is a whole world of welding training available, including nine different types. Just to do welding training the right way, you might need to do 400 hours. However, welding deserves to remain a focus. There are numerous welding certifications extant—perhaps as many as 1,000. Many SMACNA contractors are (or aspire to be) “code shops” under ASME codes. Often, sheet metal workers have to demonstrate welding skills to earn special certifications—which get the contracting firms “in the door” to bid on and win specialized work. “These contractors need these workers to be qualified, to have the manual skills to pass those tests and be certified—so the contractors can get the work,” Mr. Shoulders continued. For more information on this training, visit the International Training Institute website.